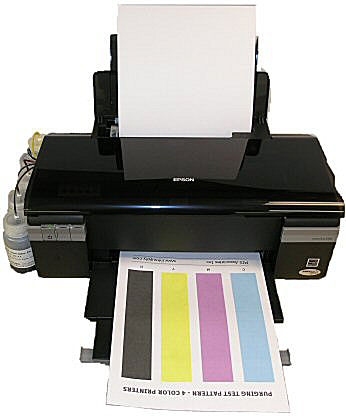 Picture this, a printer that offers up to 8.5" x 44" paper size selection as well as pigmented archival inks with a continuous flow system all for under $240.00. This great combination will give you the equivalent to 10 cartridge sets worth of ink. This will allow you to print how you and when you like without the worry of purchasing overpriced cartridges. This combination also includes double Black positions which places our setup as a real contender for an office setting when compared to color laser printer solutions. At Inksupply.com we also guarantee a quality continuous flow system delivered to your door. All of our systems our manufactured here in our Michigan based facility, which has allowed us to keep a tight control over our products since 1994. These printers are no exception, we have brought in several C120 and WF30 printers that undergo rigorous testing. These printers have different variations of the CFS to ensure reliability.